Change the World. Start Now! Join ESTHER. Would you like to change the world? We would! Do you believe that it is possible for people to join together to build community across faith traditions, race, class, gender, ethnicity and many other differences that might ordinarily keep us apart? Are you inspired by Dr. Martin Luther King's vision that we can, one day, live in shared abundance, because poverty, hunger, homelessness, racism and bigotry need not exist if only we respect and honor each other and work together? Are you tired of, frustrated by, and alarmed at hate speech directed at people living in poverty, people of color, immigrants, those of “different” faiths? Will you join us? 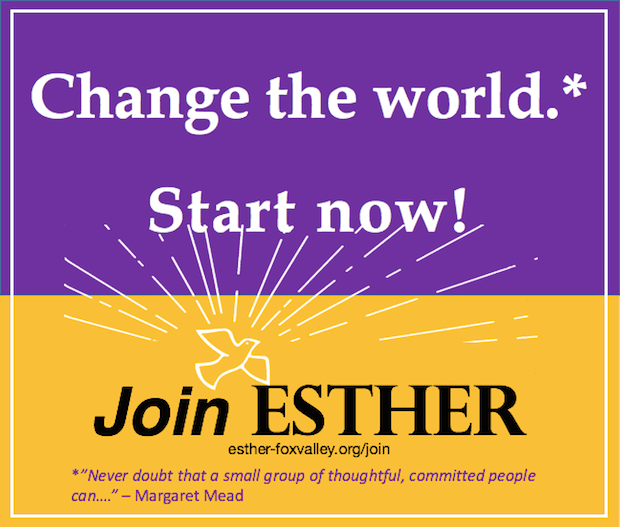 Will you become a member of ESTHER, or renew your existing membership? Join ESTHER now, and receive a full-color window cling to show your support in your car, office, or on any window! But more important, by becoming a member, you become part of a group of forward-looking people who work toward a more just and generous world.